What motivates you? We know that your work to get paid and meet your needs, but what makes you take extra time and effort to do a job well? Why do people work for the government and why do some contribute so much more than others? As a former HR specialist these are questions that I am motivated to examine. Clearly, there are carrots and sticks to consider when looking at what makes Feds go. 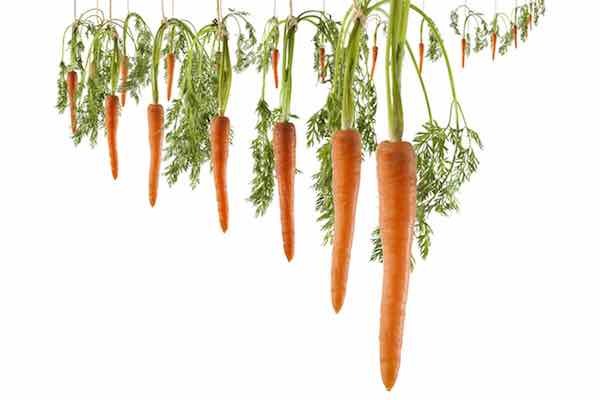 This article focuses on the most commonly considered carrot – money. There is ample reason to believe that the General Schedule will be abolished over the next few years and replaced by a pay-for-performance (PFP) system. It will likely be shaped by “pay bands” in which new hires are placed when hired. After that, annual salaries will only be increased based on performance reviews. When I first arrived as a civilian employee of the Department of the Navy (after 5 years with the Social Security Administration) I was astonished at how the DoN conducted performance evaluations. Appraisals were done on IBM punch cards that had been overprinted with three words: “Quantity”; “Quality”; and “Adaptability”. My supervisor punched my rating into one of three levels: Outstanding; Satisfactory; and Unsatisfactory. We both signed on the back of the card and the deed was done. Then came the Civil Service Reform Act (CSRA). “Critical Elements” and “Performance Standards” became features of law in 1979 and by the fall of 1981, the punch cards were tossed into dumpsters in favor of pages and pages of individual metrics (most of which were never monitored) and/or streams of adjectives and adverbs. In the end, ratings were just as subjective as they had been with IBM cards, but the paperwork and procedures increased exponentially. Another feature of the CSRA was “Merit Pay”. Almost all Feds who held GS-13/14/15 positions were converted to GM-13/14/15. They were to forego “steps” and receive salary increases based on their performance evaluations. Senior managers divided the contents of a (shallow) pool of money based on those evaluations. Of course, most GM’s were presented with similar phony metrics, adjectives/adverbs, and subjective ratings as their lower graded counterparts. Once the lengthy exercise of apportioning the spoils of a “pay pool” was completed, most felt dissatisfied. Despite lofty rhetoric about objective goals and objectivity, the money was divvied up based on varying subjective criteria. Appraisals were completed after the money decisions were made, in a way that would justify the individual shares allotted. Merit Pay showed more negative effects than positive gains. After a few years, it was given a facelift and called the Performance Management and Review System or PMRS. The reboot proved no better than the original and the Congress eventually repealed the whole mess. GMs were returned to the General Schedule (GS) system and Jimmy Carter’s grand experiment with PFP was over. The advocates for incentive-based compensation (mostly consultants), however, never left us. Their contention has always been that, like themselves, Feds can be motivated to do more, better and faster by dangling dollars within their reach. In many cases they’re right. In many more, they’re wrong. Don’t look now, they’re back! “A credible performance management system” has proven elusive. President Obama’s National Council on Federal Labor-Management put together a much-touted pilot program called GEAR, which stood for Goals-Engagement-Accountability-Results. It was intended to develop and monitor improvements to performance appraisals that would pave the way for an eventual PFP system. GEAR was piloted in 5 agencies from 2011 to 2014 in an effort to show how credible appraisal systems based on individual performance measurement could be introduced and succeed. Nothing further has been heard. Neither the Council nor the Office of Personnel Management (OPM) has offered evidence of success resulting from their pilot projects. New beginning or same old stuff? This silence hasn’t deterred the Department of Defense – whose National Security Personnel System (NSPS) was the next large-scale venture into PFP. As most FedSmith readers know, it too was eventually revoked by congress due to less-than-objective evaluations and alleged favoritism. DoD is currently rolling out its New Beginnings initiative, which includes an appraisal system that, like the GEAR pilots, might prepare Feds working within the government’s biggest agency for an eventual shift to PFP. As I look through this latest initiative from DoD, I find it advocates once again for those elusive SMART performance standards (Specific, Measurable, Achievable, Relevant, and Time-Oriented). Experience tells us that this clever acronym seldom results in the intended objective measures imagined. Too often, supervisors and managers have remarked that, while such measures may apply to employees making “widgets”, they don’t relate to their own subordinates. I have yet to meet a widget worker. Americans are tired of seeing federal employees from the Internal Revenue Service, Veterans Affairs, General Services Administration, and many other agencies maintain employment, at the taxpayers’ expense, after engaging in misconduct, receiving consistent poor performance reviews, and abusing the appeals process. Even more, taxpayers should not have to pay for employees who don’t answer letters, return phone calls, or solve problems that often times are created by the bureaucrats themselves. This bill is a step toward holding federal employees accountable to ensure that citizens are receiving the best service possible. Notwithstanding any other provision of law, an employee may not receive an increase in annual rate of pay if such employee did not receive at least a score of 4 or 5 out of 5 (or an equivalent rating with respect to a performance appraisal system that does provide for such a scoring system) on such employee’s latest performance review under the performance appraisal system applicable to such employee. This lengthy sentence implies that Rokita wants Feds to return to the 1980s with a single government-wide appraisal system of 5 rating levels. More importantly, his bill implies Feds will only receive raises if their performance appraisals justify doing so. “Steps” within “Grades” would become a relic of the past. The Senior Executive Association (SEA), should be aware of Merit Pay, PMRS and NSPS. That organization, however, recently came out in support of PFP as well. It’s worth noting that, according to the OPM, 71% of SES members received bonuses in 2015. The average was over $10,000. This experience may, in part, account for their recommendation. Whether their association would tolerate such inflated ratings and payouts to the average government worker is dubious. Some Federal agencies/activities are already using PFP as “demonstration projects”, but a law mandating such a compensation system across the government would be a seismic event. There is little experience with PFP in a unionized environment – common to so many Federal settings. Similarly, “blue collar” employees are often exempted from PFP experiments. I don’t know what’s meant by “rebalancing” but there are differences between hourly and salaried workers. Finally, there’s the question of how the congress and president would fund a massive PFP system. Many activities employing merit pay as a demonstration project have seen salaries rise faster and farther than the General Schedule. One has to wonder if politicians would allow that level of incentive pay across the board. Recent episodes of hiring freezes and shutdowns leads me to wonder if a government-wide PFP initiative will be lacking the first “P”. Lastly, there is an increasing volume of evidence that merit pay isn’t a very effective motivation tool. It goes without saying that money motivates. We all need it. PFP is an obvious choice for sales representatives or people who don’t enjoy their work and need a reason to keep their shoulders to the wheel. For government workers with a sense of mission and service, it may prove to be a distraction. In a long-ago article posted to this site, I recommended a TED talk in which Daniel Pink argues that PFP may be a net demotivator. His analysis was recently buttressed with the publication of Dan Ariely’s book Payoff. (For those who don’t want to read the book, this TED talk will suffice.) Ariely, the brilliant Duke professor of behavioral economics also questions the longstanding belief that merit pay is the most effective tool for increasing productivity. Dr. Ariely’s research indicates that “meaning” may be lost in the dogma of PFP. As former Fed, and trainer for government supervisors and managers today, I agree. We all know folks who care more about money than we do. They need a PFP system. While a comfortable living and retirement motivates all of us, so does enjoying our jobs and believing that what we do makes a difference for Uncle Sam and the American people. Another merit pay system may once again interfere with what motivates Feds most. © 2019 Robbie Kunreuther. All rights reserved. This article may not be reproduced without express written consent from Robbie Kunreuther. Pay for Performance – The Best Possible Solution?